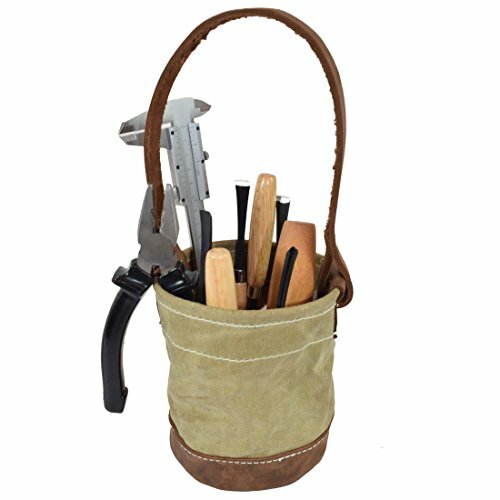 This Waxed Canvas Tool Bucket with a Leather Bottom with is hand cut and hand crafted with the finest materials to give a stylish home to your favorite tools. Easy to use, and easy to carry, this is the perfect addition for all mechanics and DIY enthusiasts. With a deep 8 inch bucket, you can store all of your trusty tools, and it's water resistant and simple to clean. Hide & Drink's Waxed Canvas is a material that will last you generations. Canvas is an ancient material, one of the oldest, in fact, and is still in use nowadays. It really is exemplary of a material that is tried, tested and true over time. Our Full Grain Leather comes from the top layer of the hide, and has all the natural full grain characteristics of the hide...hence the name. It's the best leather you can buy and the only leather that we use. The flesh side of the soft leather is first stained with natural drab tone and finished with our proprietary beeswax conditioner, helping the leather to retain its shape without the aid of synthetic stabilizers. Great accessory for DIY, Gardening, Fishing, Camping etc. PORTABLE TOOL BUCKET HAND-CUT AND SEWN FROM HIDE AND DRINK'S WAXED CANVAS: Add a touch of class to your tools and give them a stylish home with this finely handcrafted Leather Bottom Tool Bucket. Perfect for DIY enthusiasts, specialists, and even beginners who have accumulated a few tools over time, and crafted using sturdy Waxed Canvas for durability and protection, this is a stylish answer to your storage needs for your most prized tools. RUSTIC HAND-HAMMERED METAL RIVETS AND HAND-CUT HANDLE FOR EASY CARRYING: We use only high-quality materials to ensure durability and reliability, which is why we only use 100% Full Grain Leather, the best leather money can buy, to create the Tool Bucket's handle for easy carrying, and hand-hammered, heavy duty metal rivets for security and ease. Great for hanging it when you're up a ladder so you can access your tools with ease, or great for carrying around the house for different DIY jobs. PLENTY OF SPACE FOR YOUR PRIZED TOOLS: With a Leather Bottom providing a durable base, you can just throw whatever tools you need for the job into the bucket. The buckets is big enough to store a variety of small to medium sized hand tools. Or, it can double up as a great gardening bag, with enough room to fit your cuttings, your favorite plants, as well as your weeding tools, small trowels and other gardening tools. (Please see size chart to get a better idea of the size of the bucket). EASY TO CLEAN, EASY TO CARRY: Working with tools can get messy, which is why we use Waxed Canvas that is easy to clean, and ages in style. Canvas is a tried and tested material, used throughout the ages. The Canvas is lightweight and easy to carry, so it won't over encumber you if you take your tools with you on-the-go. Being lightweight, durable, and easy to clean, Hide & Drink swears by it. Useful for gardening, fishing, camping, this is a multi-purpose bucket for anyone and everyone. SIMPLE AND FUNCTIONAL DESIGN, MAKES A GREAT GIFT: This makes an excellent gift for your friend, loved ones and family. Makes a great gift for anyone and everyone, from those who enjoy a bit of DIY around the house, to the professional craftsmen and women. This Tool Bucket also serves for other trades, it's great for those who love fishing, great for chefs, excellent for storing your tools on the go or travelling, perfect for your wrenches and tools for your motorbike or car, you name it. If you have any questions about this product by Hide & Drink, contact us by completing and submitting the form below. If you are looking for a specif part number, please include it with your message.